First, I must state that I have had years of experience in plastering, wire lathing and iron working with rebar. Part of you must be an architect/designer/structural engineer. You have to envision what you're sculpture will look like before you start. You should have some artistic ability and a lot of guts. Gravel stone: pea gravel (very small); medium 1/2"; and large 1 1/2"
Rebar rods - size - 3/8" 1/2" 5/8"
We use different types of stains plus several kinds of latex paint. Process begins with an armature of rebar rods and then galvanized lathe wire is tied on to the rebar. Openings are left in different areas of the lathe so concrete can be poured in later in strategic areas. Base of sculpture is poured 8 to 18 inches of solid concrete with rebar sticking up in the air that later can be bent into a particular shape. Some parts of all sculptures are solid concrete. Some parts are left hollow. The hollow areas still have 2 to 3 inches thick of concrete that has been troweled on the lathe wire in different layers approximately 3/4" thick and allowed to cure before next layer is applied. Each layer is scratched to make it rough for the following layer to be able to bond to each other. 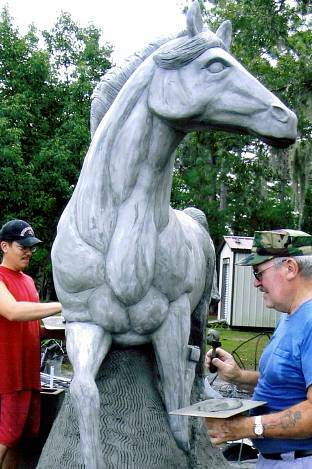 The solid base of any sculpture is allowed to cure for 7 to 10 days so when you bend the rebar for your armature, there is no damage to the base. The fine sand is used in the finish coat of concrete that is troweled on very tight for a smooth finish, hopefully without too many tiny cracks or what we call checks in the finish. If you have some, don't worry, they are not structural in any way. Techniques in Mixing - Large gravel is used in the base of sculpture for structural strength. Medium gravel can be used in the center area of sculpture. Small pea gravel can be used in arms, or legs of a horse, in other words for structural strength in small areas. Same idea for sand, course in the base, medium grade sand in other areas and very fine sand for finish. Same idea for rebar rods, heavier rods on bottom and up through the center, smaller rods in other areas. Same idea for galvanized lathe wire, heavy gauge on bottom and middle and lighter gauge in other areas. My sculptures have to be hauled on trailers all over the country with a lot of bad roads, so they have to be structurally very strong to take a lot of punishment, including being raised up by crane and boomed into position . The large sculptures on my website were built on site.